This Early Childhood Resource Pack is designed to help program planners and managers understand the basic elements of the best start in life for children and how to most effectively work together to achieve those goals. It combines advocacy arguments with experiences, exercises and information that can be used to develop skills and understand programming for young children in development and emergency situations. This toolset is comprised of five modules. 2.1 Why Invest in Early Childhood Development? Below you can download the document How to use this pack, which provides an overview of how to use the modules. Each module includes a facilitator's guide, background materials and powerpoints. 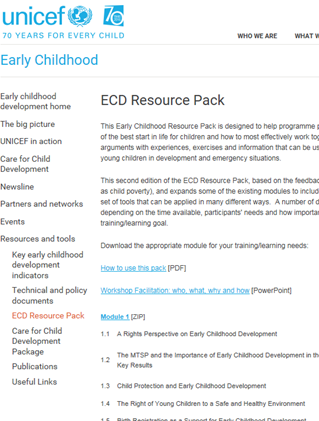 To download a module, please visit the UNICEF website here.